Road and rail contractors are about to become unpopular with the country’s drivers and train passengers as major civil engineering projects in the central belt reach a critical stage. 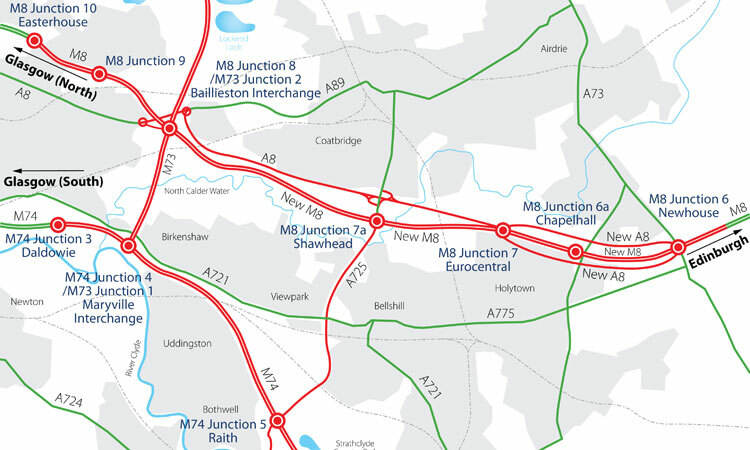 Road users have been told to expect disruption as restrictions come into force from March 20 as part of the M8/M73/M74 improvements scheme. Disruption will also be evident on the rails when activity on the Edinburgh Glasgow Rail Improvement Programme (EGIP) kicks in during the summer months. The motorway job is tackling congestion problems on the three routes and at key junctions including Raith (M74) and Shawhead (A725/A8). Traffic management will be introduced on the main trunk roads and safety cameras are being installed to enforce reduced speed limits. Construction consortium Scottish Roads Partnership recommended the installation of cameras as it gears up for a significant increase in construction in the coming months. The first restrictions and cameras will be along the M74 northbound and southbound from Junction 6 Hamilton to Junction 3A Daldowie, with three narrow lanes in operation to allow construction of a new lane and hard shoulder. Major improvements at Raith Junction will call for complex traffic management including speed restrictions, temporary lane closures and diversions, to allow excavation to begin for an underpass below an existing roundabout. The structure will link the Bellshill Bypass and the East Kilbride Expressway. Gordon MacKay, head of South Lanarkshire Council’s roads and transportation services, said: “We recognise the scale of the engineering challenges involved in the current works and the inevitable consequence of some disruption to normal travel patterns particularly during critical phases of the project. The M8/M73/M74 began in February last year and is scheduled for completion by spring 2017. On the rails, Network Rail will close the Winchburgh Tunnel for six weeks from June 13 to allow EGIP contractors in during the summer months when networks are traditionally quieter and less likely to be affected by bad weather.